CGroups look after limiting and accounting a container's resources; cgmanager  has been used for this since Ubuntu 14.04. Before then, you could access these values via /sys/fs/cgroup/. Figure 4: The lxc-info command provides an overview of the resources used by the container. To enable swap accounting, a boot option has to be passed to the kernel (Listing 3). Memory.failcnt and memory.memsw.failcnt get increased if the container hits the memory limitations. In addition to the RAM, you can also limit the used swap space per container. Table 2  provides an overview of the available CGroup subsystems. The online documentation  is comprehensive and up to date. In addition to RAM, the parameters in Table 3 also prove to be relevant. cpuset Limits CPU and memory placement for a group of tasks. blkio Limits for I/O access to and from block devices. cpuacct Generates automatic reports on CPU resources used by tasks in a CGroup. devices Allows or disallows access to devices by tasks in a CGroup. freezer Suspends or resumes tasks in a CGroup. hugetl bLimits VM page usage per CGroup. memory Limits memory use by tasks in a CGroup. net_cls Tags network packets with a class identifier. cpu Schedules CPU access to cgroups. perf_event Monitors threads of a task group on a CPU. cpu.shares The higher the value, the more CPU time the container receives. devices.allow/deny Access to the base system's devices. blkio.throttle.read_bps_device/write_bps_device Limits write and read throughput. net_cls Controls network throughput using tc. However, the CGroup feature doesn't limit a container's disk space. Either a unique logical volume per container, a separate image file, or an XFS directory tree quota can implement such a limitation. The recommended route is a unique logical volume because the LXC tools already provide good support for the logical volume manager. The commands shown in Table 4 are among the lesser known. lxc-autostart Controls containers that are configured for an autostart. 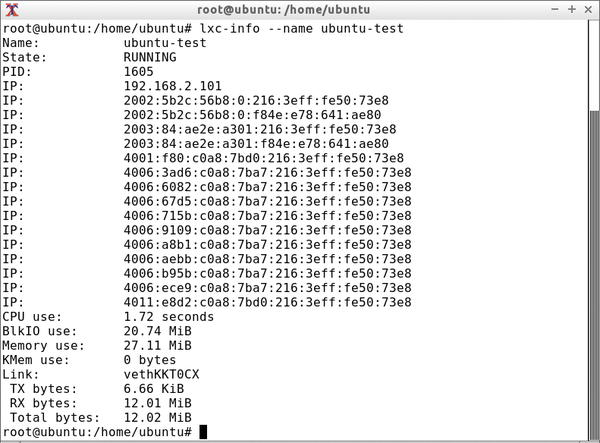 lxc-checkconfig Checks the kernel's requirements. lxc-device Passes on a device to the container. lxc-execute Executes an individual command in a container. lxc-freeze/lxc-unfreeze Freezes the processes in a container and wakes them up again. lxc-start-ephemeral Starts a temporary container clone that LXC then automatically destroys when stopping a container. If you want to use nested containers, first allocate the AppArmor profile lxc-container-default-with-nesting to the parent container. If you share the host system's /var/cache/lxc/ folder with the container, even creating will work quickly. Then, install the LXC package in the container and create the nested container as usual. The base system lists the nested containers (Listing 4). With the use of hooks, you can automate container use. The following hooks, prefixed by lxc.hook, are available: .pre-start, .pre-mount, .mount, .autodev, .start, .post-stop and .clone. The developers worked on the unprivileged containers for a long time. Since version 1.0, it has been possible to run containers on the base system without root access. The developers implement it via the user namespace and separate UID and GID ranges per container. Prebuilt containers make the installation easier because unprivileged containers do not allow some operations. Matching templates are on a Jenkins server , although the technology is still in its infancy. The LXC C API is lxccontainer.h, and the Python bindings are similar . Container solutions are not newcomers to the virtualization scene; they have existed for years. We look at the different flavors available for Linux systems. Docker helps the Linux container achieve an appealing comeback and integrates some features missing from earlier container solutions.